In recent decades, Portland, Maine – and the Old Port in particular – has elevated its profile as a location for fine dining, fine shopping, and fine arts. Maine has always been a welcoming place for artist – the wild, natural beauty of the state lends itself to artistic inspiration – and the individualistic attitude of Maine’s people creates an atmosphere of acceptance of the eccentricities of others (not that I’m suggesting that artists are an eccentric bunch…). Not only is the Old Port an ideal location to maximize sales during the busy tourist season, but also, as the city’s reputation for promoting the arts has grown, it’s become a location with great local resources for many types of artists. Maine Potters Market, which first opened in the Old Port in 1979, was an important part of Portland’s artistic evolution. 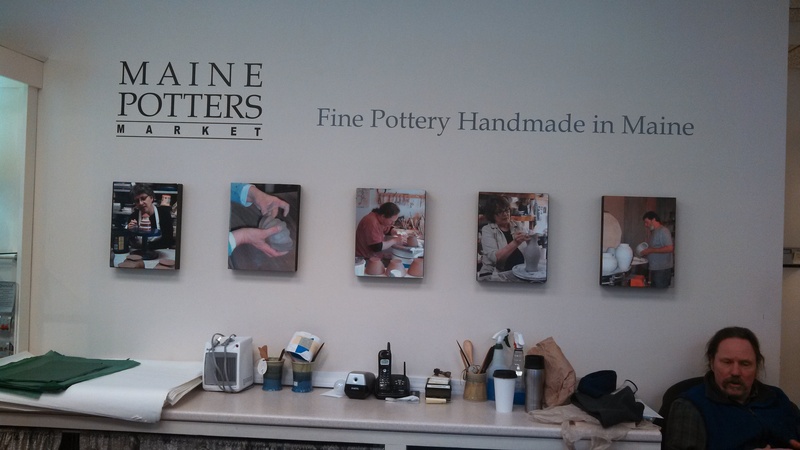 Today, the Maine Potters Market offers a special experience for a ceramic arts’ enthusiast. I had been in a time or two before this visit, but without a full understanding of the way the store operates. Now, knowing more, my appreciation has grown. Maine Potters Market operates as a cooperative of ceramic artists (potters), each with their own unique style, which in turn ensures they have something for everyone. As a non-profit cooperative, they have pooled their resources into this Old Port location, where each day of the week, one of the potters is running the store. This allows the opportunity for a customer to learn from and meet the people whose work they are purchasing. When I ventured in a little over a week ago, David Orser was running the shop. David and his wife, Laurel McDuffie, market their pottery under the name Cedar Mountain Potters. Barbara Walch’s work – my personal favorite! The inception of this group occurred during the winter of 1977, when a group of potters envisioned a cooperative marketplace to sell their wares. In the spring of 1978, they first opened in Boothbay Harbor, where their modest success led them to open their year-round Old Port location in 1979. 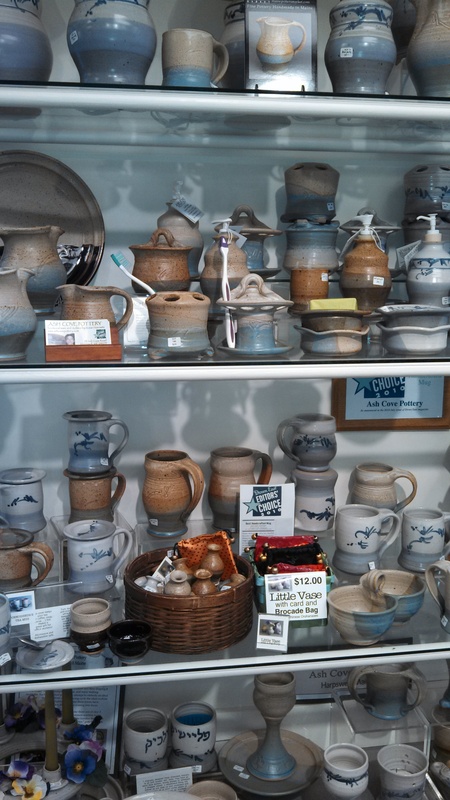 Although their location has moved and things have changed over time, the core of the Maine Potters Market has remained the same – their store is home to plentiful and varied pottery, and most days, you will still find a potter working in the store. Today, they have 15 artists and have just begun a search to add a new member. Their space is bright and airy, with nothing to distract from the pottery itself. 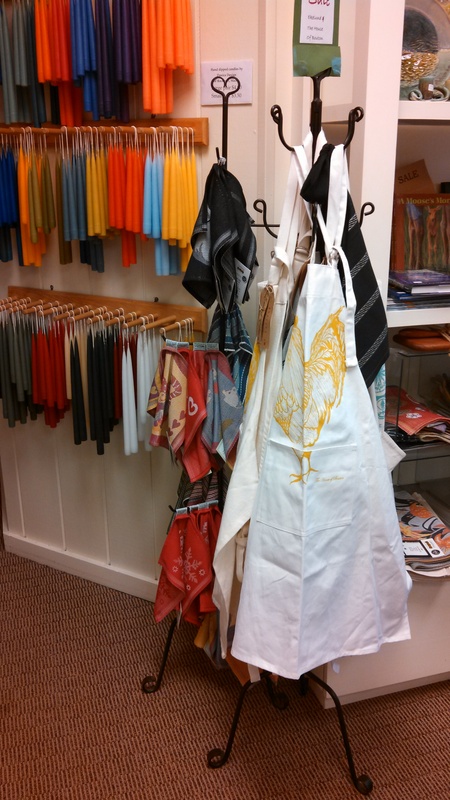 At the back of the store, they do sell a number of books, aprons, and other goodies. I could go on at length about the styles of the potters, my personal preferences, and the friendly, welcoming feel of the space – but frankly, I recommend you just go visit them yourself! I am sure you’ll find something to love. 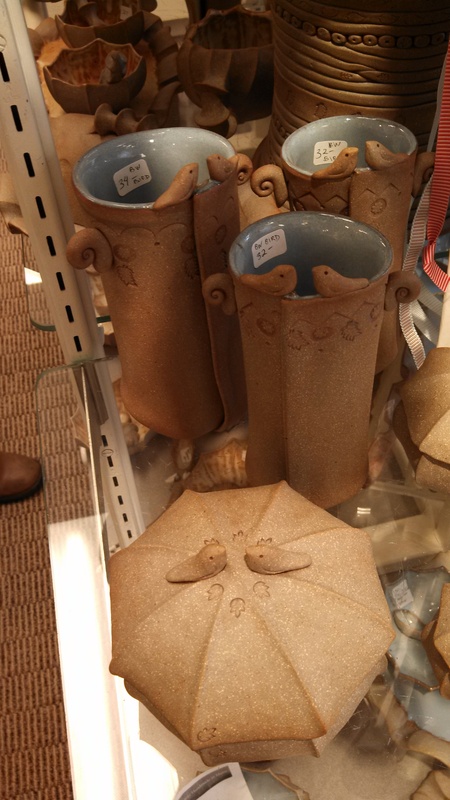 Categories: Play, Shop | Tags: arts, ceramic arts, Maine, Maine Potters Market, Old Port, pottery, shopping | Permalink. 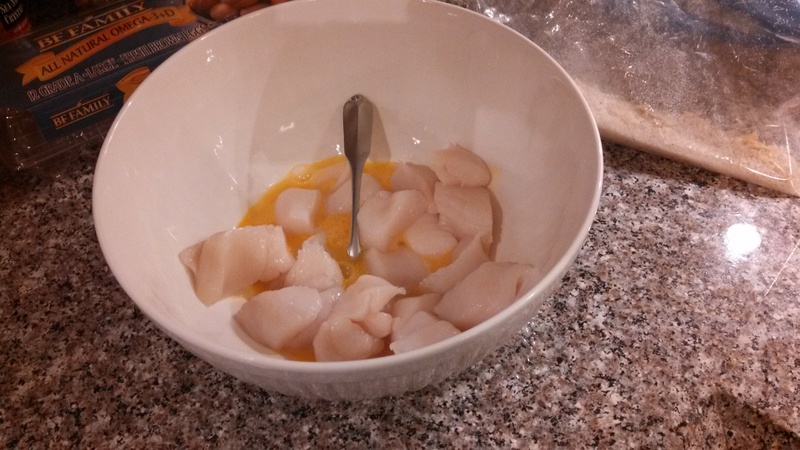 As you might imagine, fish and seafood play a prominent role in the diet of a Mainer. The geography of Maine, as well as its rural environment and long history of gaming, make it inevitable that this would be so. In addition to the ocean, an undeniably important part of Maine’s economy and food supply, Maine has many lakes, rivers, and streams – at least 5,785 lakes and ponds alone. A part of what made my childlife so full, in my opinion, was my constant exposure to the outdoors and outdoor sports, including fishing, hiking, hunting, and much more. 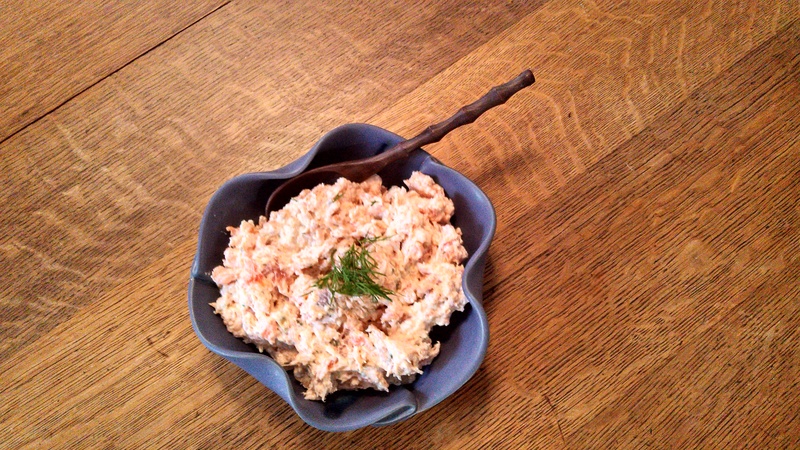 My new cookbook, Maine Home Cooking, features many fish and seafood recipes (as well as venison – hopefully my husband will get a deer this year so I can share those with you), and when I came across this one for a Smoked Salmon Spread, I was immediately inspired to make it during my weekend in Maine. My initial thought was of how much my sister loves smoked salmon, and I wanted to make something I knew she would enjoy. My mother also pointed out how much my grandfather loves salmon – for as long as he was able, was an avid fisherman and went on an annual salmon fishing trip to Lapoile, in Newfoundland – and I was, after all, home for his 90th birthday. So it was quickly decided that we would make this spread and take it to share with the family on Saturday evening. We doubled it and it was a hit – the entire bowl was wiped clean. Throw all ingredients into a food processor or mixer and whirl until you reach your desired consistency (I like mine a bit lumpy). Adjust seasonings to taste, and serve with crackers. This would also be delicious as a spread on bagels, toast, or even pasta – my sister took the leftovers and used them in just this way! I chose to incorporate all of the optional ingredients, because I love those flavors and I felt they would work nicely together. We used roughly the juice of one lemon, just a splash of Tabasco, a tablespoon of chopped dill, and about a 1/4 cup of capers. Delicious! 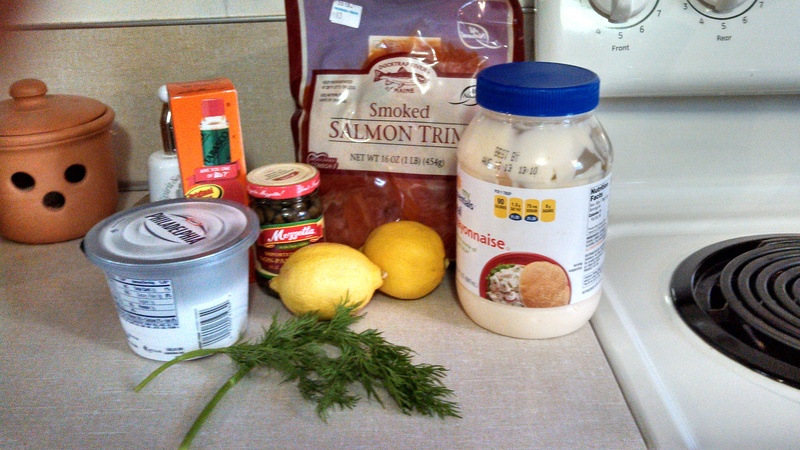 Categories: Eat, Weekly Recipe | Tags: appetizer, capers, cream cheese, dill, fishing, lemon, Maine, recipe, salmon, salmon spread, smoked salmon | Permalink. 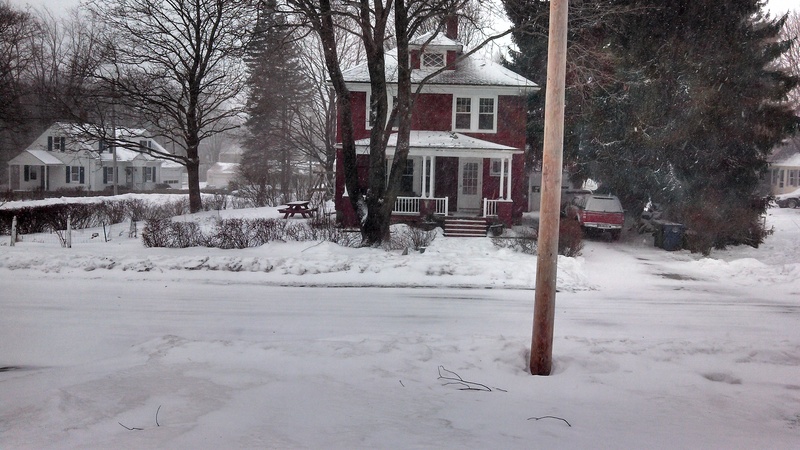 It’s been a snowy Sunday here in Maine – and so wonderful to be home! Although my flight to Charlotte is right around the corner (I’m typing this at my gate), I’ve enjoyed every moment of my time here. This morning, my mom, sister, cousin Stephanie, and I continued our tradition of getting together for a girls’ breakfast when I’m in town. We’ve tried a number of the local breakfast places, and they can each claim a unique charm and personality. This was my first ever visit to Siano’s, a neighborhood pizza joint that also offers breakfast, but I had high expectations, having gone to high school just down the road at Catherine McAuley, where Siano’s pizza had reigned supreme as the Friday hot lunch option. I knew from this personal experience that their pizza was delicious, but I was relying on my mom’s recommendation that their breakfast would be well worth trying. Sadly, I have no photos to share of my breakfast, as I was starving when it arrived and it was excellent. My omelette, which consisted of cheese, spinach, tomato, onion, and mushroom, was more than half gone when I remembered my intentions. While the food was very good, perhaps my favorite thing about our breakfast experience was the relaxed atmosphere at Siano’s. Our waitress was friendly and attentive, but didn’t rush us as we lingered over our meals and chatted (an unpleasant experience I’ve had at other breakfast places). There was also something charming about observing the cooks prepare massive quantities of pizza dough for the lunch and dinner rushes; watching the fires roar in the brick ovens; and experiencing the flow of conversation at tables around us – all of which was indicative of the family-friendly, neighborhood restaurant that Siano’s is. Several patrons greeted each other by name, and everyone wore a smile as the stomped in out of the windy, snowy cold and into the welcoming space. Now, I’ve got to catch my flight back to NC – but don’t forget to stop by Siano’s in the future – for breakfast, lunch, or dinner! Categories: Drink, Eat | Tags: breakfast, dinner, local dining, lunch, Maine, pizza, Portland, Siano's, Stevens Ave | Permalink. The other day, on my two-hour drive from Charlotte, NC to Mt. Airy (a small town that’s most famous for being the inspiration for Andy Griffith’s Mayberry), I was mulling over my plan for Maine Roots’ weekly recipe and it dawned on me exactly why my favorite cookbook is Recipes from the Maine Kitchen – and why I’m so certain I’ll come to love my new cookbook, Maine Home Cooking, nearly as much. It’s simple, really, and practical – as Mainers tend to be – the recipes in both books reflect these realities about the people that use them. The recipes themselves are straight forward, and deceptive in that they are as delicious as they are simple. The recipe serves 4 and can be found on page 140-141 of the cookbook. Preheat the oven to 350. Cook the orzo according to the package directions. 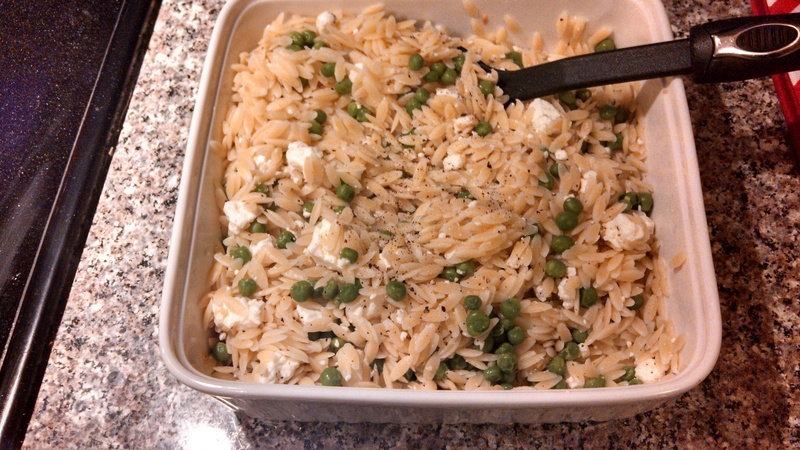 Mix together the cooked orzo, shellfish, feta, vegetables, and salt and pepper. Mixing up the good stuff! Bake for 30-40 minutes, or until the feta is melted and bubbly. The results were excellent! 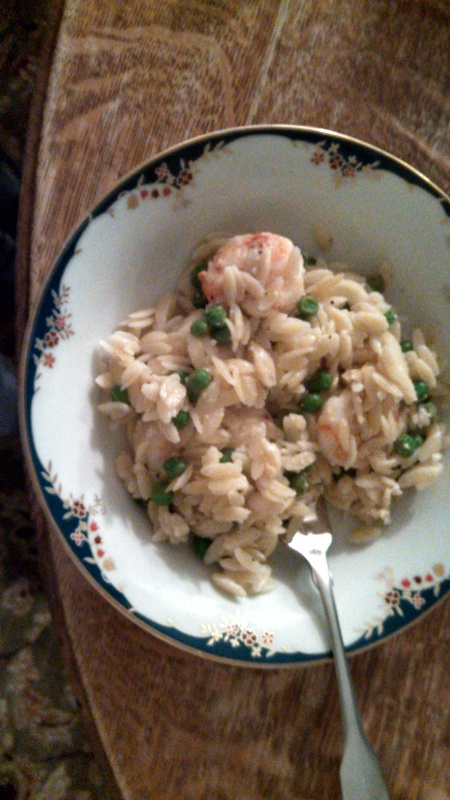 I loved the dish, although I would add more veggies next time (I only added peas this time). Nick really enjoyed it – I could tell he meant it, because while he always compliments my cooking – there’s a different degree of enthusiasm when he truly loves something (for example, lasagna). I’ve also been told there are not enough pictures of the chef herself! 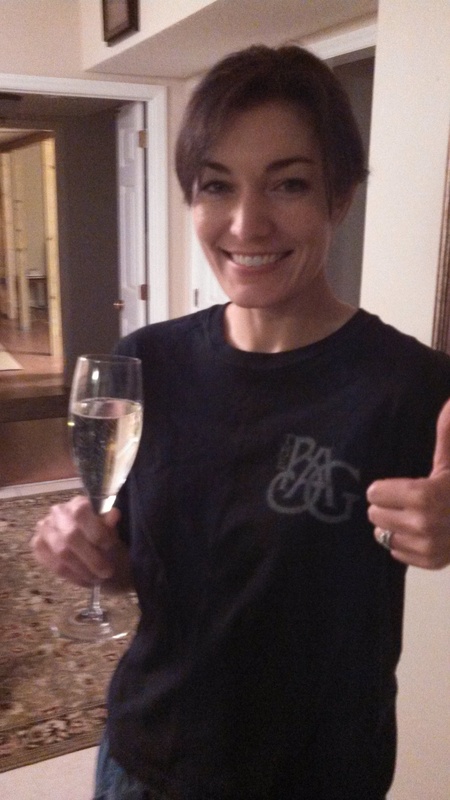 Here is a shot of me – including champagne and a thumbs up – in our NC kitchen, but wearing my Christmas gift from my brother – a shirt from The Bag at Sugarloaf! Today is definitely a ‘this ‘n that’ post. I have several things to share that I find very exciting, and I hope you will, too. First, an explanation and apology for the relatively quiet blogging weeks I’ve had recently. Next week, I will be back in Maine (hooray!) to celebrate my grandfather’s 90th birthday. I am thrilled to get back home, and over the last month, a great deal of my time has been dedicated to preparing our family’s gift to him – a photobook, made on mixbook.com, that compiles many of the Stark family photos from the beginning of the 1900s through 2013. This project has been a wonderful experience, but has left little time for blogging. 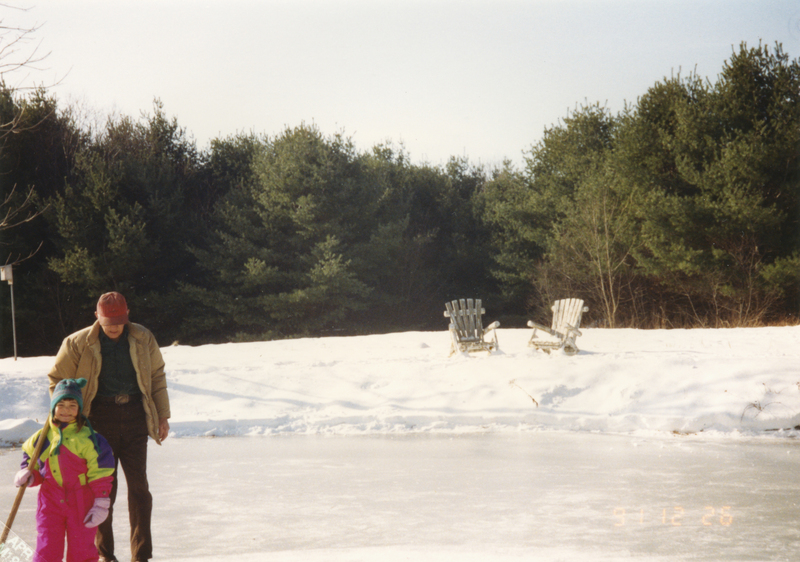 However, one of my favorite aspects of the project has been the opportunity to learn about my mother’s side of the family, their travels from New England to Europe, and their return to the States, including the 1965 purchase of my grandparents’ first home – a house in the Pennellville Historic District in Brunswick, Maine. This home, which features classic New England architecture and has a rambling, farmhouse feel, is where many of my favorite childhood memories took place. Being back in Maine will also give me the opportunity to visit some new places to share with you all. Now is the time to begin planning that spring or summer vacation to Maine! (or your Maine wedding- more on that to come!). Second, today is my 27th birthday. It has been a very happy birthday, and I have much to be thankful for at this point in my life. 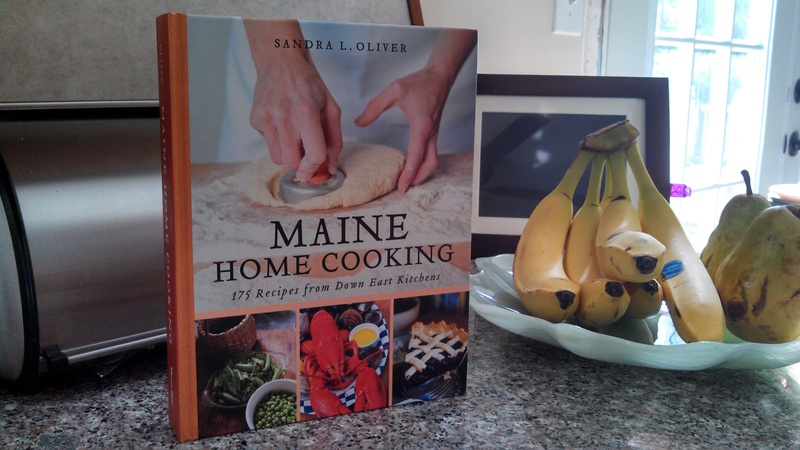 One of the gifts I received from my mother is a new cookbook from Maine – written by Sandra L. Oliver and published by Down East – it is titled ‘Maine Home Cooking: 175 Recipes from Down East Kitchens.’ After just a brief scan, I am filled with excitement to try and share some of these home recipes from Maine kitchens with you. I’m also looking forward to learning more about the author, Sandra Oliver. I find her fascinating already – she lives on the island of Islesboro, Maine, is a food historian and freelance food writer, and she also gardens, preserves, cooks (of course), and teaches sustainable lifeways. Sustainable living, in the sense of growing and raising your own food supply, is more than just an important piece of American pioneering history – it’s also a skill that few of us can now claim, and one that I am increasingly interested in learning. Lastly, some of you may recall my New Year’s Eve post on the unique New Year’s celebration of Eastport, Maine. Eastport was once home to thirteen sardine factories, and it is no secret that this industry, like so many others in Maine, has suffered, shrunk, and vacated. Over the last decade, a significant effort has been made to revitalize downtown Eastport, and I was thrilled to stumble across an article from the Bangor Daily News, posted on Twitter, that highlighted this ongoing endeavor and, in particular, the effort to renovate and restore one of the last remaining empty buildings, the 1908 Seacoast Canning Co. building at 15 Sea Street. This building is a waterfront landmark, and the current owners (Dirigamus LLC) are looking to develop it – either themselves with additional partners, or buy selling it to a party that has the means to do so. The building is zoned in Eastport’s Shoreland General Development zone, which allows for a variety of office, retail and hospitality uses – and the three partners of Dirigamus LLC envision a hotel and residential conference center. For more on the plans for this historic building, please follow this link to the article. An interesting note – Dirigamus LLC is a partnership formed by three women – Linda Godfrey, Nancy Asante, and Meg McGarvey – and their name is the Latin plural meaning “we lead,” a take on the state of Maine motto, Dirigo, which means “I lead.” These three have clearly played a fundamental role in the revitalizaton of Eastport. Way to go, ladies! Categories: Eat, Play | Tags: Brunswick, development, Down East, Eastport, economy, family, Maine, Maine Home Cooking, Pennellville, Sandra Oliver | Permalink. Buffalo Chicken Dip is an all-time favorite of mine. It is everything, in my opinion, that a Super Bowl appetizer should be – a little (or a lot) unhealthy, a perfect complement to a good beer, and a consistent crowd-pleaser. While I’m still getting over the Patriots’ loss in the AFC Championship, the prospect of buffalo chicken dip did brighten my Super Bowl outlook, so I made it for the party we attended yesterday. The best part – not only is it delicious, it’s also really easy. 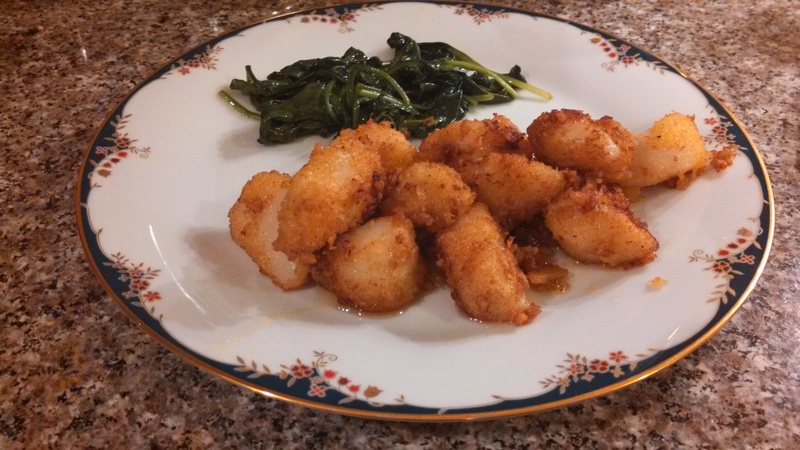 Technically, I took the recipe from my cookbook A Matter of Taste, a collection of recipes from the NAIW Maine Council. But I modified it quite a bit in terms of the preparation and cooking process. 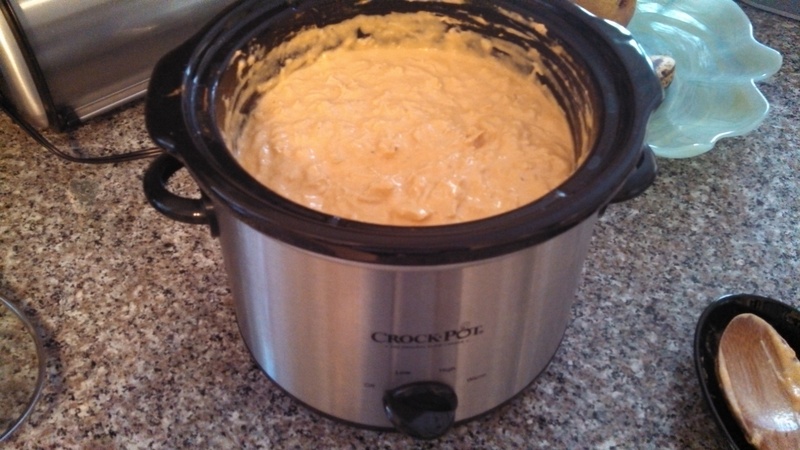 Allrecipes.com also has a great Buffalo Chicken Dip recipe. Let the modifications begin! First of all, for a dish that is only going to end up being unhealthy anyway, there is no way I’m poaching and shredding chicken myself. I buy the canned, cooked chicken and drain the water. I also hate celery, so I don’t use it – and I don’t think anyone misses it, either. The next big modification is that this recipe calls for you to cook it in a large skillet – chicken first, then hot sauce, then cream cheese, and so on. I always (always) use my Crock Pot. I turn the crockpot on high and heat the chicken. 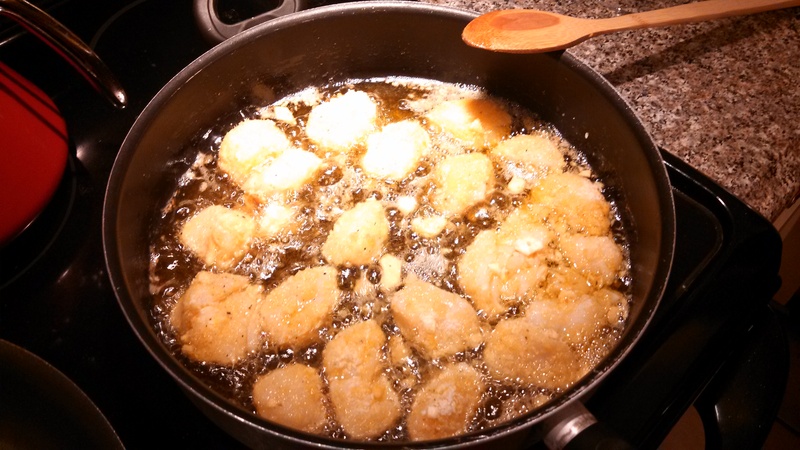 Next, I stir in the hot sauce and let that heat with the chicken for a couple of minutes. I mix in the cream cheese, stirring until melted and blended, then I add the Ranch and blend in. I give it a few minutes for everything to get hot again, and add the cup of shredded cheddar, stirring until mixed in and melted. After that, it’s ready to enjoy! 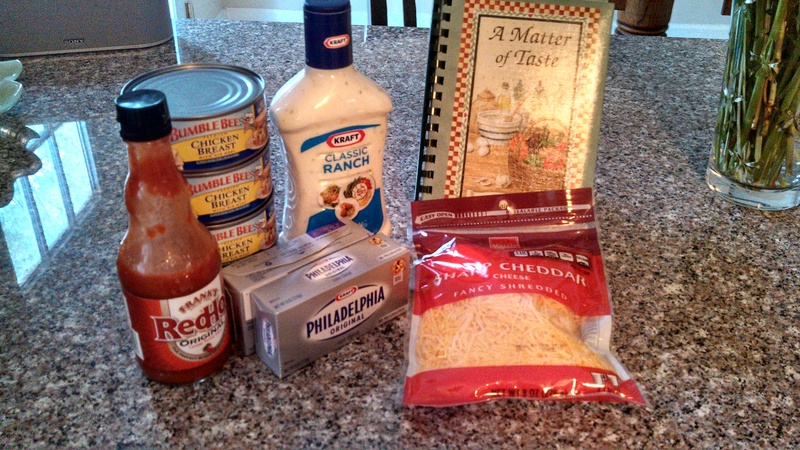 Categories: Drink, Eat, Weekly Recipe | Tags: appetizer, Buffalo Chicken Dip, Frank's Red Hot, home cooking, hot sauce, recipe | Permalink.